Today at CES, IDrive is announcing our most innovative storage device yet, IDrive One, a 1TB or 2TB external encrypted drive that offers lightning fast wireless access, extended Wi-Fi range, fast local encrypted backup, media streaming and each drive comes with a year free of IDrive cloud backup. In terms of speed and space, IDrive One is fitted with 802.11 AC, giving you speedier connectivity, while maintaining backwards compatibility with devices geared toward older wireless standards. AC is the speediest and strongest wireless standard today. It’s connectivity travels through more walls with faster speeds and works with both old and new technologies. With a range of up to 150 feet, you’ll never feel tethered to IDrive One as you might with a wired device. 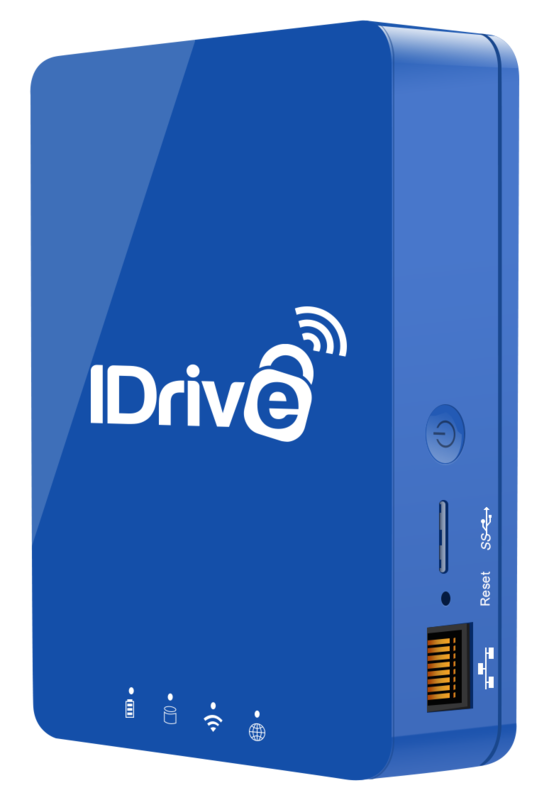 With IDrive One users are no longer limited by their mobile device storage. And with the modern household or business having multiple iPhones, iPads and Android devices, storage tends to fill up fast. But with the IDrive One app users can quickly transfer their photos, videos, and music right to IDrive One. This frees up storage so users can continue taking photos/videos without interruption. The IDrive One app also enables users to stream music, pictures, and videos, to their mobile phones, tablets or computers, which is compatible with iOS and Android devices. This is particularly convenient for users with limited storage on their devices. If you can’t store more data on your device, you can stream all your media from IDrive One to your mobile phone or tablet, enabling users to extend their mobile storage. No more of those annoying out-of-storage messages when you are trying to take a picture or video. All data backed up to the IDrive One device is guarded with military grade encryption as data is protected with 256-AES encryption with an optional private key, that is only known to the user, so that no one else can access your data but you. IDrive One will be available Q1 of 2016 and comes in two models 1TB ($99.99) and 2TB ($149.99). Each includes a free year of IDrive Cloud Backup for an added level of protection. For 2TB buyers we’ve upped your cloud space to include 2TB of IDrive backup storage, which is perfect for our power users. Also 1TB IDrive One customers will get 1TB of cloud space, helping them backup all of their devices to the cloud. Want to see IDrive One up close? CES-goers can visit our booth at LVCC, South Hall 4 – 36080, January 6-9, 2016.